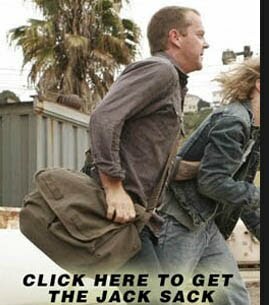 The Jack Sack™: 24 Season 7: Jack Bauer Insurance- JackState! Okay, so David Palmer and some little green lizard are the current spokespeople for car insurance companies. Now, add Jack Bauer to the list. Who do you trust most? Does it cover loss of home to a Russian suitcase nuke and injuries sustained during torture by a terrorist group and/or a government agency? (Note to self: Don't be drinking when watching videos from Jack Sack). I could watch for hours... just for the Dubaku car roll.